Precious metals continued higher Monday with gold hitting a four-week high. The U.S. Mint also started selling its new bullion 2015 American Silver Eagle. Precious metals advanced to start the new trading week on Monday. Gold and silver notched a second straight session of gains while platinum and palladium extended their winning streaks to three sessions. Also on Monday, the United States Mint started accepting orders for its newly dated 2015 American Silver Eagle bullion coins. Back to precious metals prices first, gold for February delivery tacked on $16.70, or 1.4%, to close at $1,232.80 an ounce on the Comex division of the New York Mercantile Exchange. Gold ranged from $1,217.50 to $1,235.20, its highest price since Dec. 10. "Gold prices ended the U.S. day session with solid gains and scored a four-week high Monday," Jim Wyckoff, a senior analyst at Kitco Metals Inc., said in a report. "Safe-haven demand was featured amid recent stock market shakiness and lingering worries about the European Union’s economic and financial health." Gold surged 2.5% last week for its first weekly pick-up in four weeks. 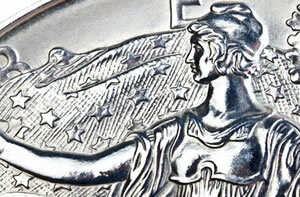 Silver for March delivery rose 15 cents, or 0.9%, to settle at $16.56 an ounce, trading between $16.43 and $16.69. The white metal was the biggest winner last week, jumping 4.1%. April platinum added $10.90, or 0.9%, to close at $1,241 an ounce, ranging from $1,227.10 and $1,246.60. Palladium for March delivery settled up $13.95, or 1.7%, to settle at $814.10 an ounce, trading between $800.50 and $814.95. Last week, platinum gained 2.2% and palladium added 0.7%. Palladium added $11, or 1.4%, to $806 an ounce. Last week, London bullion fixings ended with gains of 3.9% for gold, 3.4% for silver, 2.7% for platinum and 0.5% for palladium. First-day sales of 2015-dated America Silver Eagle bullion coins hit 2,958,000, figures from the U.S. Mint show. As was the case in December when its supply of 2014-dated Silver Eagles sold out, the Mint is rationing how many they sell to maintain an inventory. And similar to a week ago when the agency released its 2015-dated gold bullion coins, Silver Eagle starting sales are already higher than those from December. Introduced in 1986, the series monthly sales record happened in January 2013 at 7,498,000 coins. Sales in January 2014 ended at 4,775,000 coins. U.S. Mint sales of its gold coins advanced as well on Monday. 2015 American Gold Eagle bullion sales for January now total 51,500 ounces, the highest total since November’s 60,000 ounces. Sales in January 2014 reached 91,500 ounces. 2015 American Gold Buffalo bullion sales for January now total 22,000 ounces, the most since January 2014 when sales for the month ended at 41,500 ounces. Below is a sales breakdown of United States Mint bullion products with columns listing the number of bullion coins sold on Monday, last week, in December, last year, and the year to date. Coins with an asterisk (*) have sold out for 2014.